Jalandhar: Reputed globally, Bollywood’s rap-music composer, rapper and co-singer Badshah (aka Aditya Prateek Singh Sisodia) reached Lovely Professional University Campus, today, where he interacted with LPU students and entertained them on his famous musical pouring. He also shared with students about his journey as an engineering student to dream becoming an IAS and ultimately getting exposed to new and revolutionary Punjabi music. He also forwarded tips to LPU students for getting into the realms of ‘Rappers’. 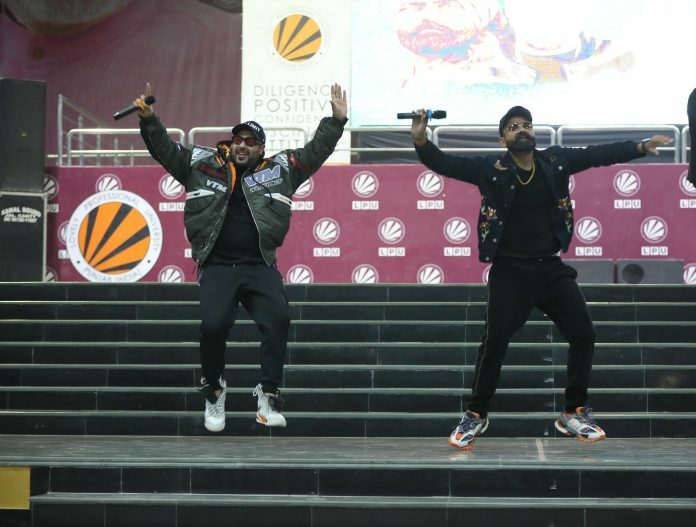 Thousands of LPU students danced, yodeled, tapped, rapped, shrieked on Badshah’s famous songs presented by him at Baldev Raj Mittal Unipolis stage of the university. In a single-liner message to students, Badshah conveyed: “I have learnt if you dream big, nothing is impossible.” He also informed students that his genres are Bhangra, Desi hip hop, Bollywood and above all Rap-Music compositions, Co-singing, Rapping and Rap lyrics. Badshah has also worked along with Yo Yo Honey Singh, Diljit Dosanjh, Gippy Grewal, Arjun Kanungo, Sean Paul, Tanishk Bagchi, Neha Kakkar and more.